Like Sisyphus pushing a giant cheeseball up a hill, PepsiCo remains dogged in its pursuit to try and provide healthy snack options to a consumer that, despite saying they want nutrition, longs only for cheese-dusted fingers. 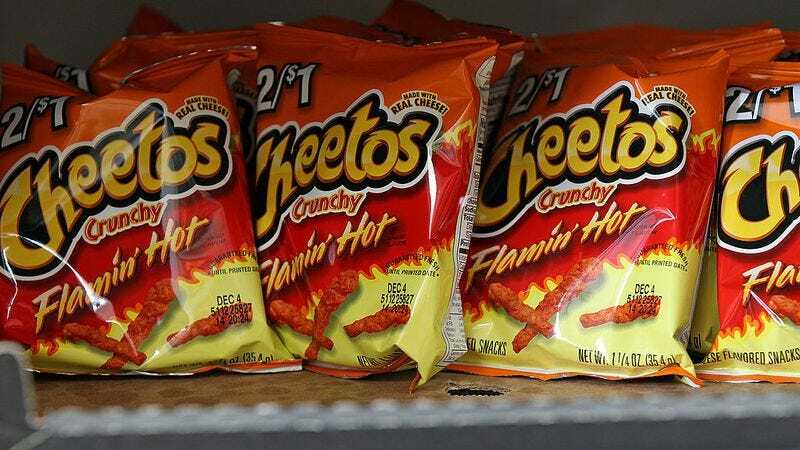 According to the Wall Street Journal, despite setting aggressive goals for its nutritious products, PepsiCo has found sales of fatty, salty snacks like Doritos and Cheetos continually on the rise. Consider this another example of Americans saying they want something healthy and sustainable, but then choosing what is literally the worst possible option. PepsiCo CEO Indra Nooyi considers the company’s development of healthier products “an ethical imperative.” She also believes it can be a boon for the PepsiCo financially. Though you may not realize it, PepsiCo is behind “good for you” brands like Quaker oatmeal, Naked juice, and Smartfood Delight popcorn. They also recently acquired KeVita Inc, a maker of fermented probiotic drinks. Among her many aggressive goals, Nooyi hopes to reduce the average amount of fat and sodium in the big brands by 2020. Unfortunately, those targets aren’t on track. Sugars added in manufacturing have increased, several launches have foundered (including the “mid-calorie” Pepsi Next), a bid to remove aspartame from Diet Pepsi failed miserably, and global retail sales of the old standbys (Doritos, Cheetos, Lay’s) have averaged annual growth rates of 5%. While PepsiCo has had to readjust its goals, it’s admirable how much the company is sticking to them, especially when it could probably just kick back and let Chester Cheetah do all the work. The company has made headway in reducing sodium and saturated fat in its snacks, and plans to roll out a new brand of veggie chips next year. In October, they announced their 2025 goal is for its nutritious products to “outpace” the salty stuff. And, hey, if all else fails, there’s always bugs.